Ask most people how to make push-ups harder and they’ll tell you to do more reps. In fact you often see competitions of how many push-ups you can you do non stop (the world record is 10, 507!). This is a great way to train if you want to build muscular endurance. What if your goal is to get stronger or build more muscles mass? Would you do as many reps as you could with a low weight performing the bench press? Of course not and calisthenics is no different! To build true pushing strength, you need to progress the exercise to a level that requires super-human levels of strength. 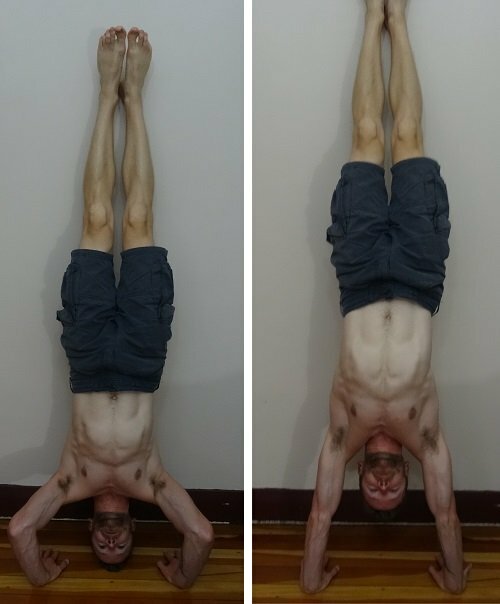 Enter the One Arm Push-up and the Handstand Push-up! The first progression after full push-ups towards the one arm push-up is the close hand push-up. By moving your hands closer together, it puts more emphasis on your triceps, which will need to grow stronger in order to perform a one arm push-up. The next progression after decline push-ups towards the handstand push-up, is the pike push-up. In this exercise, we move the arms so that they are in a vertical pressing position, rather than the horizontal pressing position used in push-ups. To make it easier than a handstand push-up, we simply put some weight through the legs. 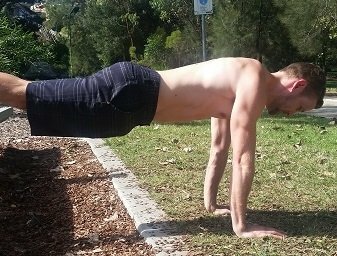 The first progression after full push-ups towards the handstand push-up, is the decline push-up. By elevating your feet, more weight will go through the upper body, which will condition your body ready for the next progression.